The K'NEX Hornet Swarm coaster dates from 2016. The building set code is 17038. Click here to download the building instructions for this set. 1. Click on [Request] below for each missing part, to add it to the Shopping cart, where you can enter the quantity missing. 2. Proceed to Checkout, enter your name and address, and answer four questions to establish proof of purchase. 1. Click on [Buy] below for each part that you need, to view the product page for that part, and then select [Buy] again. 2. Proceed to Checkout, and enter your name, address, payment method, etc. Alternatively, you can use the menu on the left to identify and purchase the parts that you need. Ref Code Description Request or buy? 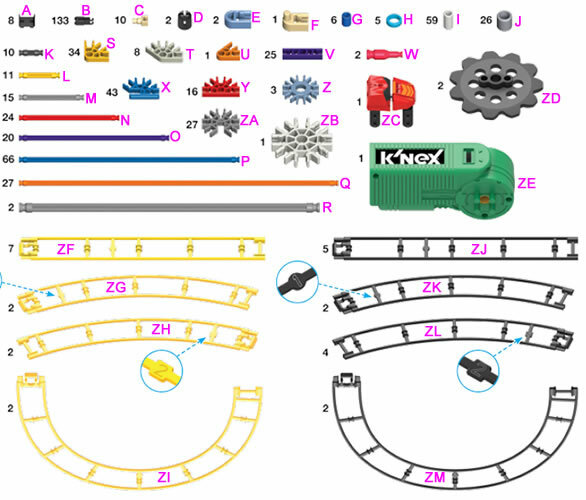 Do you offer K'NEX accessories?